I have struggled on and off in the past with WORRY. I think it is something that we all have had to face at one time or another.? I came across this cartoon and it really made me think about about how easy it is to get overwhelmed with our problems. According to Wikipedia, the definitition of Worry is – an emotion in which a person feels anxious or concerned about a real or imagined issue, ranging from personal issues such as health or finances to broader issues such as environmental pollution and social or technological change. “Therefore I tell you, do not worry about your life, what you will eat or drink; or about your body, what you will wear. Is not life more important than food, and the body more important than clothes?? Look at the birds of the air; they do not sow or reap or store away in barns, and yet your heavenly Father feeds them. Are you not much more valuable than they? Who of you by worrying can add a single hour to his life? And why do you worry about clothes? See how the lilies of the field grow. They do not labor or spin. Yet I tell you that not even Solomon in all his splendor was dressed like one of these.? If that is how God clothes the grass of the field, which is here today and tomorrow is thrown into the fire, will he not much more clothe you, O you of little faith? So do not worry, saying, `What shall we eat?’ or `What shall we drink?’ or `What shall we wear?’? For the pagans run after all these things, and your heavenly Father knows that you need them.? But seek first his kingdom and his righteousness, and all these things will be given to you as well.? Therefore do not worry about tomorrow, for tomorrow will worry about itself. Each day has enough trouble of its own. It is really our choice whether we worry or not.? It IS POSSIBLE to choose NOT to worry.? Someone used to say to me when I was worrying about situations in my life and their possible outcome – “What’s the worst thing that can happen?”? That is so true!?? What IS the worst thing that can happen?? I think about that and realize that my issues are really nothing in comparison to the many issues that people struggle with throughout the world.? There are so many people hurting and dieing and struggling.? Who am I?? Why should I waste time worrying when God SAYS that He cares for me even more than the birds?? He just asks that we seek Him first. We need to stop looking at ourselves and turn our eyes outward towards the needs of others! What can YOU do?? What kind of impact can YOU have within your family, your workplace, your community – if you get out there and dedicate time to ministering to the needs of others?? I challenge you to get out of that pit of worry and despair.? Even if your situation seems hopeless – THERE IS HOPE!? God cares for you and He wants you to seek HIM first. Thanks so much for allowing me to share.? It is always healing for me to express what I am going through and hopefully help someone else at the same time. 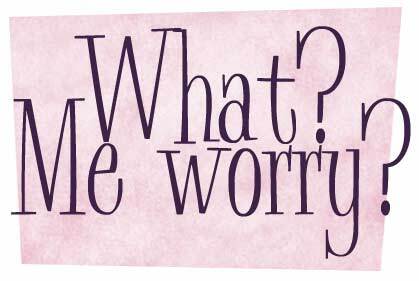 Do YOU worry?? Have you struggled with worry in the past?? Please comment about what you have done to overcome it. Love this post! I used to worry alot, too. My husband says, “Worry is interest paid before it’s due”….I guess that made sense to me. I was spending my time and energy worrying about something that hadn’t even happened yet. What I do to attempt to get some sleep is to think of all the good things that happened that day, think of the smile of my baby boy and how many times my children actually listened the first time I asked them to do something. Also a HOT HOT shower works great for me to alleviate the stress of worrying – it’s the only time I get “alone time”. I’ve struggled with worry on a regular basis since I was very young. I have tried many of things to unsucessfully to “fix” it (eating, smoking, drugs) I have since found that a mixture of prayer, quiet times with God, and exercise help me deal with and overcome worry. This article was very insightful and well written. Great Job! !